A black and white large format negative of an unidentified man standing with two large dogs. The negative envelope has the name Lowes - Carrington & dogs. The photograph was taken on Concession 3, Whitby, Ontario. 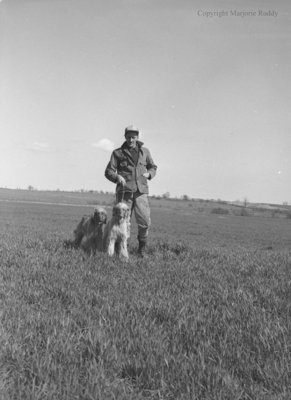 Unidentified Man and Dogs, May 7, 1950, Marjorie Ruddy. Whitby Archives A2013_040_256.